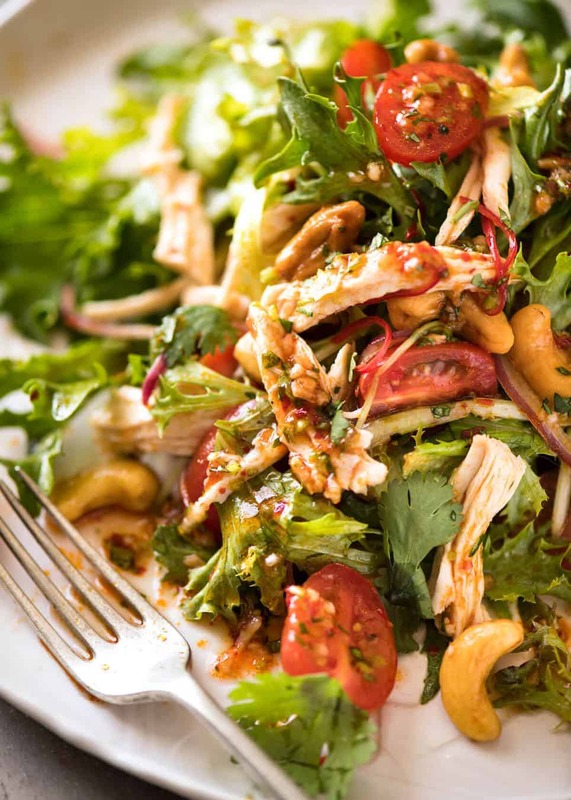 Get your taste buds dancing with this bright Thai Chicken Salad! 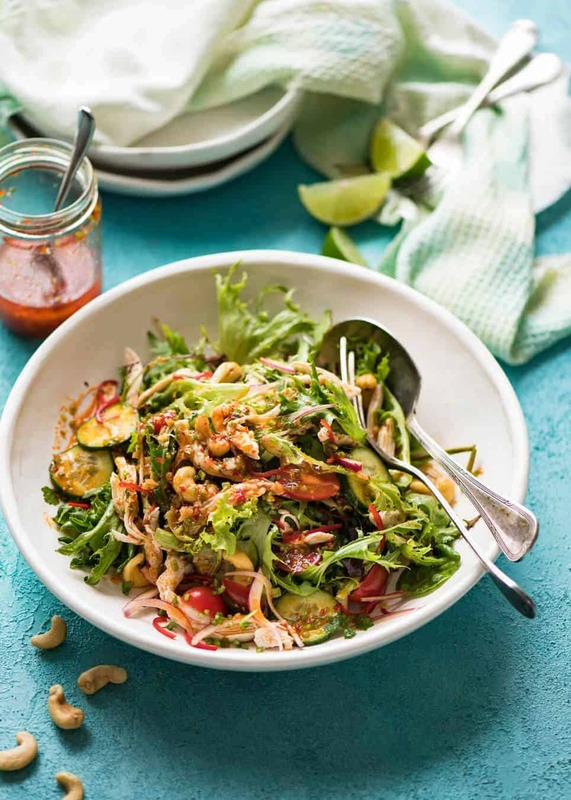 The zesty Thai chilli lime dressing with the signature South East Asian balance of sweet-sour-savoury and a little heat from chilli will make any salad exciting! A THAI CHICKEN SALAD WITH BIG FLAVOURS! Yowzer! This is about as far as you can get from bland, boring salads. I’m a huge fan of Asian salads because they are typically much lighter and fresher than many Western ones, and the dressings pack a great flavour punch. And this one is no exception. It’s a chilli-lime Thai dressing that has that South East Asian signature sweet-salty-tangy balance with a little buzz of heat from chilli. I know it looks really spicy because it’s red. But actually, it’s not that spicy because I make this using a store bought Chilli Garlic Sauce. You won’t find me eating this by the spoonful but actually, it’s not that spicy, it looks more dangerous than it is in reality. Go on, have a taste test! 1 teaspoon of this doesn’t even have the same amount of spiciness as 1 Thai or Birds Eye Chilli. 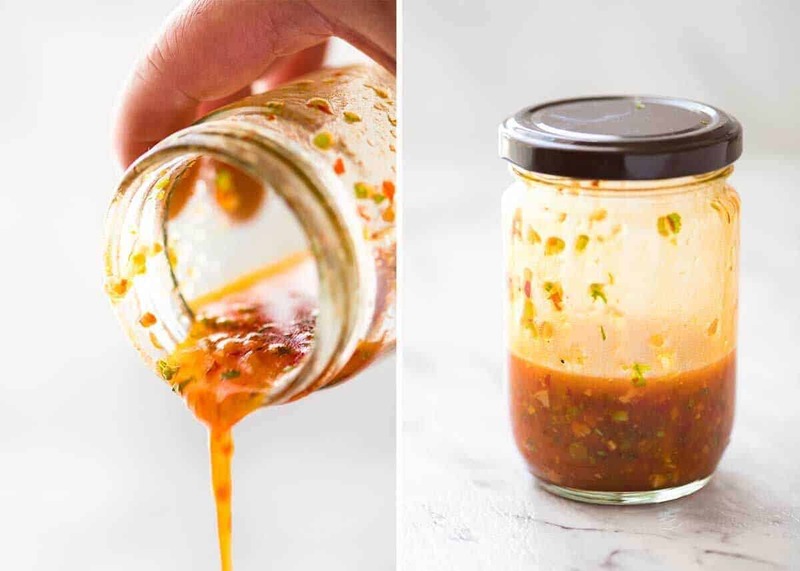 Chilli Garlic Sauce is a terrific trick for thickening dressings / sauces in the same way mustard does in Western dressings, as well as adding spiciness / garlic + some tang because it’s not just made with garlic and chilli. It’s pretty common nowadays, sold at all the supermarkets here in Australia in the Asian section. But don’t worry if you can’t find it, I’ve provided plenty of alternatives in the recipe (Sriracha, hot sauce (even Frank’s), fresh chillies, chilli paste, sambal oelak – loads of options!). Ah yes, I almost forgot. The spice-adverse may be alarmed to see yet more chillies in the photo above – the finely sliced red chillies. But fear not! Firstly, they are large red chillies that actually aren’t that spicy at all. Rule of thumb is: the larger the chilli, the less spicy they are, the smaller they are, the spicier they are. I honestly would not classify this salad as really spicy. The dressing is warm rather than spicy and I barely notice the fresh chilli tossed through the salad. If this was on a restaurant menu that had a spiciness indicator in the form of chilli icons, with 1 chilli being mild and 3 chillies being “blow your head off” spicy, this would be a 1 chilli dish. Recipe VIDEO above. 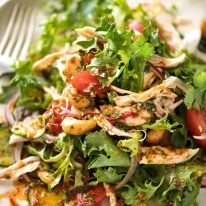 A chicken salad with a fantastic Thai chilli lime dressing with a great tangy-sweet-salty-spicy balance that South East Asian food is known for. Using Chilli Garlic Sauce is a great way to thicken dressing as well as adding more layers of flavour. Serves 2 as a main, 4 as a side. Remove chicken from water and shred, then cool. Place Salad ingredients in a large bowl. Drizzle over most of the Dressing, toss. Serve immediately, drizzled with remaining Dressing. 1. Large Chilli: The larger the chilli, the less spicy it is. I use Cayenne peppers which are common here in Australia, they are about 12 cm / 5" long. 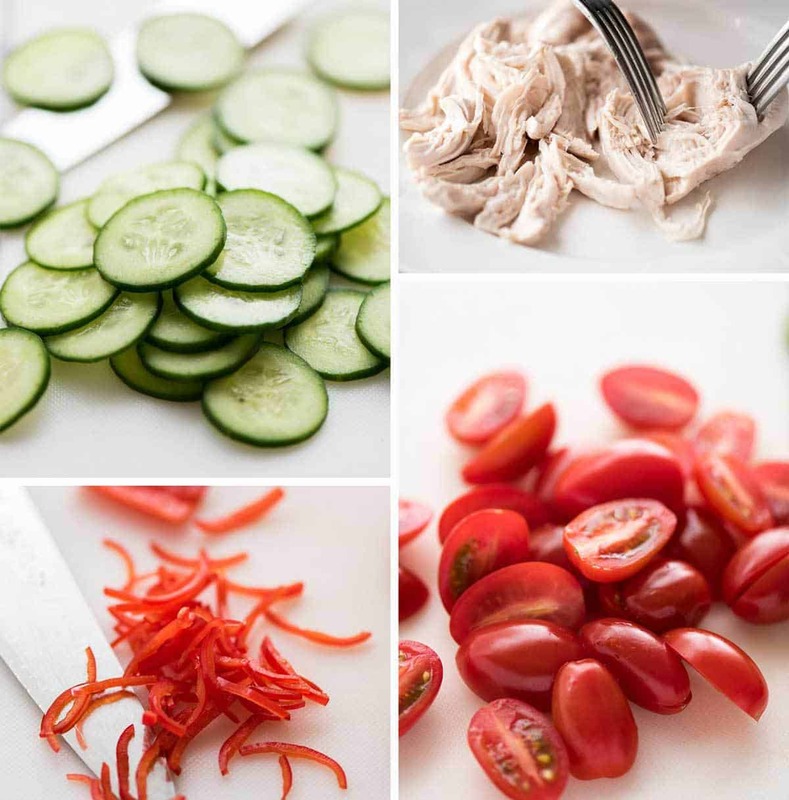 They are not that spicy once sliced thinly and dispersed throughout the salad. It's more for colour and a bit of heat, so you can leave it out if you're concerned. Watch the video to see how I deseed it with a spoon and finely slice it. 2. Chilli Garlic Sauce is a terrific sauce sold in jars that is now widely available in supermarkets here in Australia (Woolies, Coles etc). 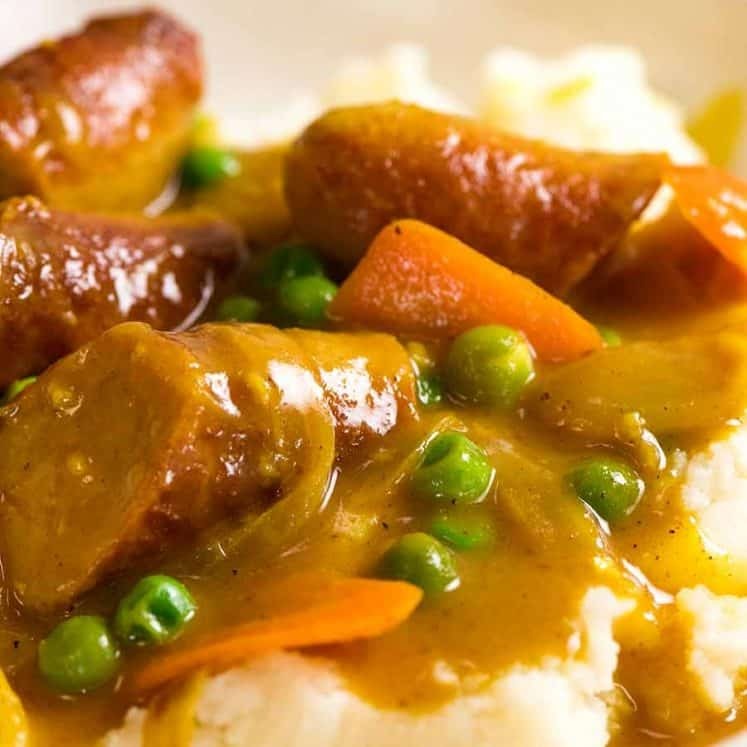 It's made with chilli, garlic, vinegar and some seasonings so you get lots of extra flavour layers by using it in a dressing, plus it thickens the sauce like mustard does in Western dressings. 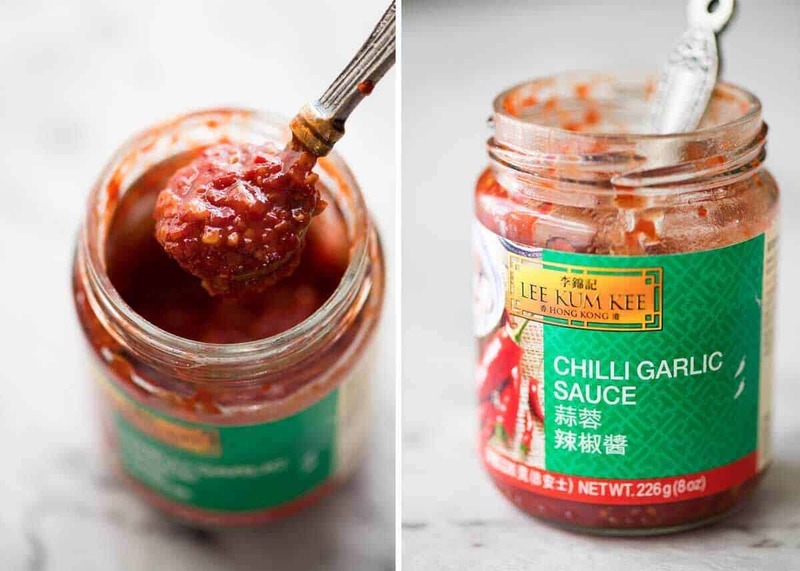 Can be substituted with: sriracha, any hot sauce, crushed chilli in a jar, sambal oelak or other chilli pastes. Because the spiciness differs, start with a conservative amount and adjust to taste. 3. Fish Sauce: This can be substituted with soy sauce if you really insist - or need to. It's not quite the same because fish sauce has more complex flavours than soy sauce. 4. Chicken Poaching: This is a foolproof way to poach chicken, guaranteed to come out juicy every time and it is scientifically impossible to overcook the breast. The chicken can stay in the water for 45 minutes and it will still be the same as it was at 20 minutes. If your breast is larger than 220g/7oz, boil for 2 minutes before taking it off the stove, then leave for 20 minutes. Read more about this method in this recipe: Foolproof Poached Chicken Breast. 5. DRESSING: You should not be able to taste any of the ingredients individually. Too sour, add more sugar and oil. Too sweet, add more lime and/or fish sauce. Too fish-saucy, add more lime, oil and sugar. 6. 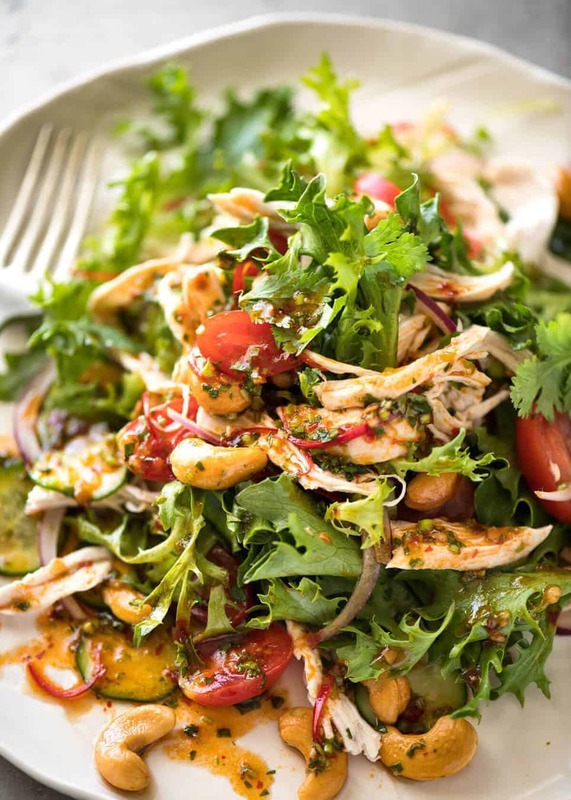 SPICINESS: This salad looks spicier than it is because of that gorgeous fiery red colour of the dressing! But actually, it's fairly mild. The dressing has a warm tingle rather than the bite of spiciness, and the chilli in the salad is sliced very finely and it's not a spicy chilli (see Note 1). Feel free to adjust the spiciness to your taste - just add the chilli gradually into the dressing. 7. 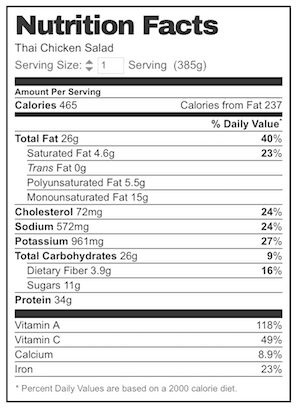 Nutrition per serving, assuming 2 servings. 148 calories is attributable to the cashews, so there's an opportunity to cut down on calories here (but note the cashews make this salad extra special!!). He spends a lot of time in this position. We made this last night with left over chicken. It was absolutely delicious as is almost every recipe I’ve made of yours. Thank you so much and I love Dozer! Wahoo, I’m so glad you love it Leslie! I really enjoy your website and all these exciting recipes. You and Dozer are wonderful. Simple and tasty. I was looking for a summery recipe and something that didnt involve a lot of work. The fool proof poaching is a great start, but the salad is straight up zingy good. Nagi, since we found your website, we cook about 3 of your recipes every week and we love all of it. Everything is so tasty. 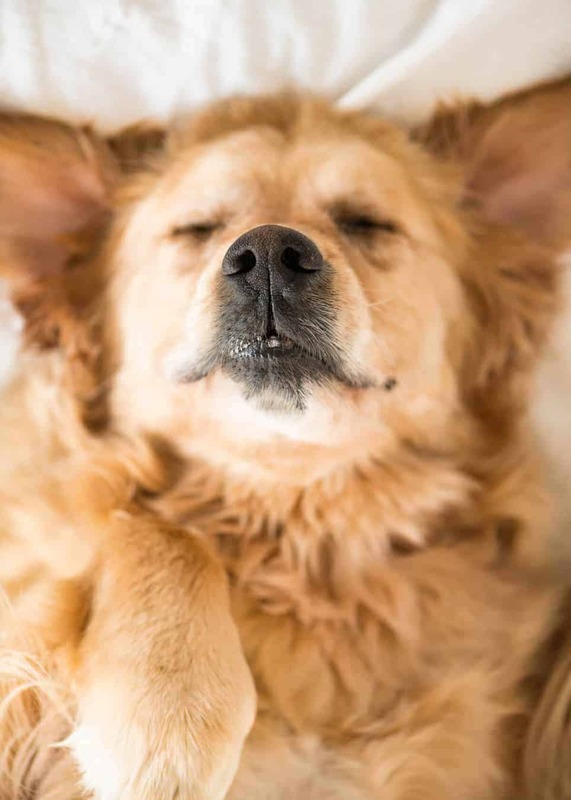 We couldn’t be happier to have found you! Thanks! I’m so glad you found me Mary!! You’re so welcome Mihi, thanks so much for the feedback! It’s ridiculous degrees here in Canberra today and this salad hit the spot. Thanks Nagi! This was so easy make and so delicious. 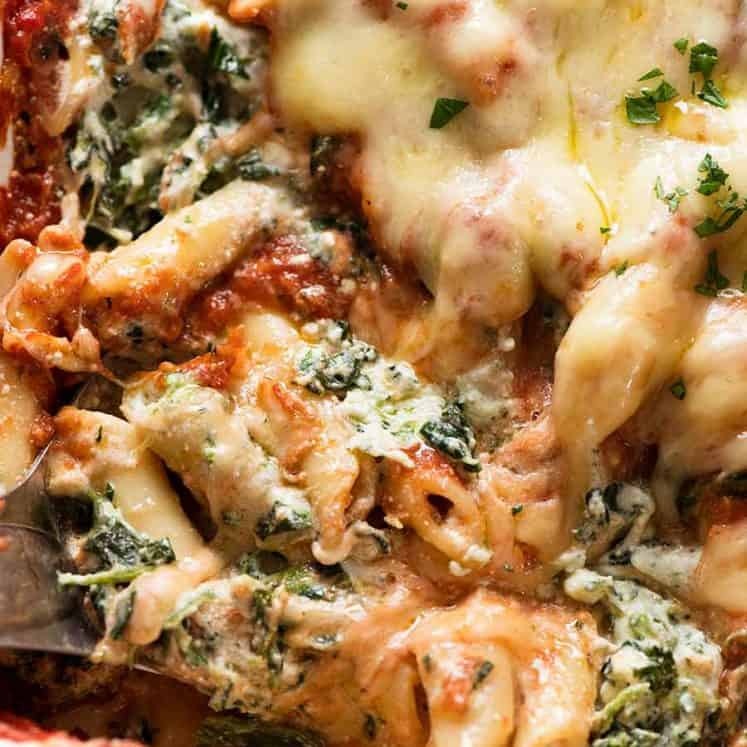 Soon to be a staple in my weekly meals for sure. What great feedback, thanks Rebecca! I made this last night and it was delicious! So nice and flavoursome but also filling! I like how you provide the trouble shooting tips also! That helps! Thanks! One to make again! And I have already eaten half of what was to be my lunch this morning! MMMM! Another hit of a salad for our apres bike ride pot luck. This one got moved from the buffet area right to the table! Loved the poached chicken idea and will use that again and again. The salad looks amazingly healthy and delicious! I’ve never tried the chilli-lime Thai dressing but guess it is super tasty as Asian food is so yumm! I was wondering if we should smash the cashews or not. You know… to eat easier. This has everything I love in it. 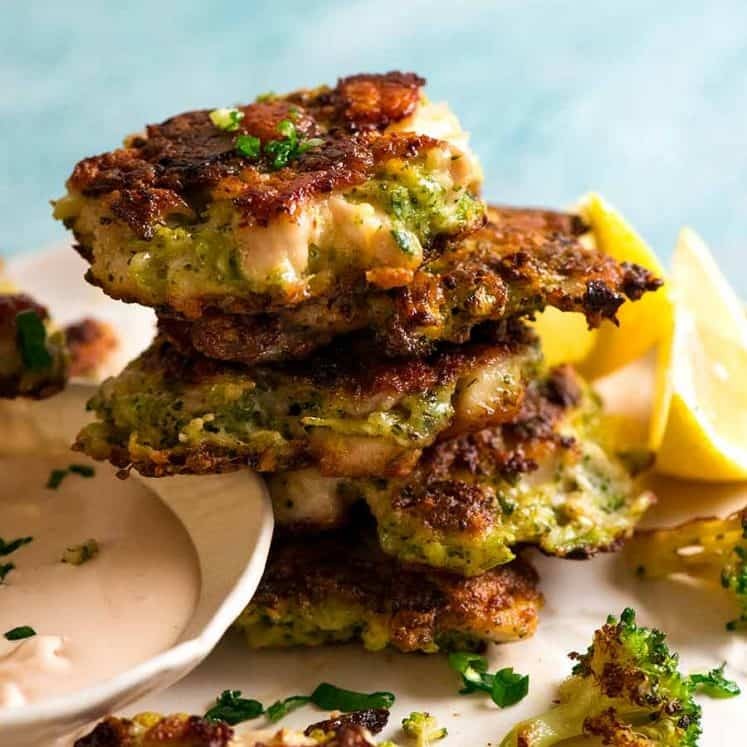 I have had great success with all your recipes in the past so I am sure I will love this one when I make it this weekend. I also want to make it for a social party but I have a friend who has allergies towards ginger and chillies :-/ Do you know if I can make a no-spice version of this awesome salad dressing? I can make 2 versions that way. Hi Nicky! You mean a salad side or something like fried rice??? Yes just something to serve with the salad or would you just have that as a meal? That’s exactly what I did last night to this beauty….add vermicelli noodles – they worked a treat and bulked up the salad somewhat. I actually prepared the salad the night before as well as the dressing (keeping the dressing separate in a jar). I did add extra chilli so the dressing had a real kick. This salad was so refreshing after a pilates workout, I know what awaits me for lunch today and looking forward to it. Thai beef salad, sliced tuna / salmon – this salad will work well with any protein. I actually turned the meal into three jar salads that lasted really well for 3 days. Dressing, chicken and wetter ingredients at the bottom. The mixed lettuce and some carrot in the middle layer and cashews on top. Super easy meal prep! and kind regards from New Hampshire.